Paul is a Waterbury, VT native who comes to us for the snow production industry, and worked as an installer for Gardener’s Supply Company. In his free time, you can usually find Paul snowboarding, biking, hiking, gardening, or otherwise exploring the Vermont landscape. 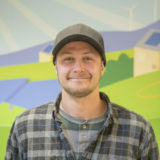 As a student and Solar Installer, Paul is always excited to learn new things, and talk about solar systems, or gardens.